In 2008, two of the five worldwide highest grossing movies of the year came out on the same date in July (the 18th, to be exact). Coming in at number one that year, The Dark Knight, arguably changed the movie world for good. Maybe not for the better, but the effect it had certainly seems like it could be long-lasting, if not permanent. Superhero movies have exploded since 2008, although a lot of the credit for that obviously goes to Iron Man, which came out two and a half months prior, and started the Marvel Cinematic Universe that is still going strong today (although a shocking firing could certainly lead to some long-term changes in the successful franchise). More than that, though, Christopher Nolan’s The Dark Knight earned its late star, Heath Ledger, the second ever posthumous acting Oscar, while its shutout from the Best Picture race probably caused the Academy to expand the field for its highest award, something that seems to be a permanent change (its no longer a ten-movie field every year but has been higher than five ever since the 2009 ceremony). Finally, its financial success seems to be what finally put Christopher Nolan on a wider radar, with most of his films since achieving both critical and financial success. It’s a movie that many people of my generation consider to be one of the best movies they’ve ever seen, even to this day. Four years later, its sequel ended Nolan’s Batman trilogy on something that is almost unanimously considered a low point of the director’s career. The other movie was Mamma Mia. 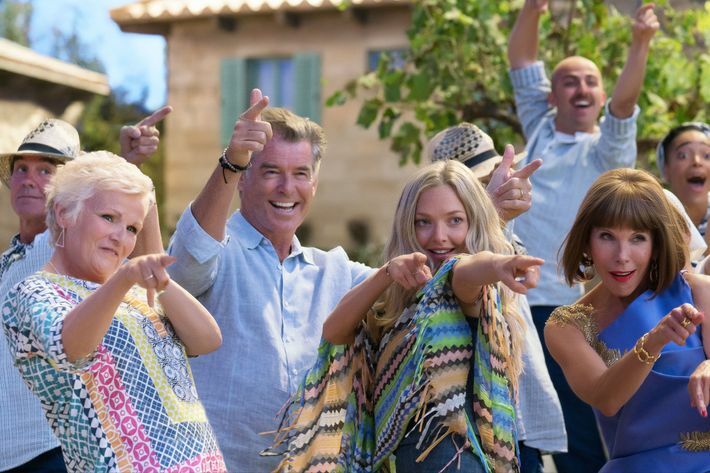 It “won” Pierce Brosnan the Razzie’s Worst Supporting Actor Golden Raspberry Award for Worst Supporting Actor. Ten years later, the sequel was released. It likely will not change the movie world, or its genre. I do not foresee it being nominated for any major awards this winter, and I don’t think anyone will consider that to be any major slight against the film. It’s also genuinely the most I’ve enjoyed myself in a movie theater this year, and probably the purest fun I’ve had in a long while (Thor: Ragnarok excluded). To be honest, I enjoy the first movie pretty well, but on the level of “what a gloriously stupid mess this thing is,” with the fact that the cast is clearly having the time of their lives helping me get over some of the issues that the movie so obviously has. But this movie actually works on the level that it wants to. It’s a movie that has family, and the many ways that a family can manifest itself, on its mind and, more importantly, at its heart. Writer/director Ol Parker took what the creative team behind the first film tried to achieve, but made it feel more real and focused than the original film ever really comes close to. There’s hardly a moment that isn’t filled with pure heart, whether it be the returning cast reflecting on the legacy that Donna, Meryl Streep’s character, left behind a year after her passing (Streep’s role in this movie is basically a glorified cameo, but, y’all, it is used for maximum effect), or the new cast, mostly utilized as past versions of Donna (a perfectly charming Lily James), her two friends (with Jessica Keenan Wynn, in particularly, impressing at someone who genuinely feels like a clone of Christine Baranski), and her three potential fathers to Sophia (all three of whom deserve recognition, but Hugh Skinner’s bumbling charm is a perfect fit for Colin Firth’s cautious Harry Bright), playing their love and concern for each other earnestly and genuinely. The MVP of the film’s heart is probably, and I truly cannot believe that I am saying this, Pierce Brosnan (who is best known, obviously, for his role in Mrs. Doubtfire). From a brief but brutally heartbreaking cover of the previous film’s unintentionally funniest song (him screaming “WHEN YOU’RE GONE” on “SOS” will never not [sort of a double negative] bring me the most intense joy) to the most earnest of greetings when he encounters Firth and Stellan Skarsgard’s characters for the first time in a long while, Brosnan seriously comes to play on this movie. And when he’s not busy giving the movie a surprising amount of heart, he is having the time of his life. Which is really true of the entire cast, and that’s where this movie really, truly wins a spot in my heart. Yes, the cast is having fun in the first movie, but there is something about it that feels different in this one. They feel freer. The first one is a weird combination of people who are clearly having a good time, all while trying to lift up a deeply nonsensical story. Here, it feels like they know the story is mostly just there to move us along from song-to-song, and because of that, they’re letting loose. Something else that plays into that is that this movie’s musical moments are executed with so much more panache and skill and actual choreography than the first movie. Honestly, the first movie’s musical moments are all quite bad. They’re choreographed in the way that a Kidz Bop live show is probably choreographed where everyone learns one move so that the least musically inclined individuals (read: everyone in the first movie who isn’t Amanda Seyfried’s Sophie or Christine Baranski) can do the same thing as everyone else. In this movie, the choreography team (the only credited person I can find is Associate Choreographer Nichola Treherne) seems to understand the talent they have and fills the background with skilled dancers while the main cast seems to be given the direction of “Do whatever.” As big numbers like “Waterloo” and “Dancing Queen” show off the skills of the ensemble, the main cast gets to have a lot of fun, like Skinner playing baguette guitar while crossing some chairs or Skarsgard and Firth executing a wonderfully random Titanic pose (“I’m flying, Colin!”), while Brosnan just kinda jumps around and runs his hand through his hair. It’s nonsense, but it’s fun nonsense that doesn’t need to look good. Everyone else is doing the heavy lifting, the main cast is free. I should also note that the biggest step up the musical numbers get is that most of the songs include the legitimately talented James, who has the unenviable job of trying to play a younger version of one of our most decorated performers but executes it with excellence. She’s perfectly charming and has wonderful chemistry with all three of her suitors. The fact that her voice is the most pleasant the franchise has given us (actual singer Cher non-included, because, well, she’s Cher) makes her character and performance that much easier to love. This movie is not perfect. I could spend time in this article writing about the movie’s flaws, and they would be valid. But honestly, get out of here with that nonsense. The world is negative enough, and spending time ragging on a jukebox musical that’s only goal is to warm hearts and be fun feels like an intense and absurd waste of time and energy. I’d much rather celebrate what this movie is: a two-hour distraction from reality that had me smiling from start to finish. And what a wonderful gift that is.